Top Secret Cardio: Heat It Up! Get leaner, get lighter, get moving! Torch those last few ounces of fat with this collection of Top Secret cardio tips. Cardio is great for heart and respiratory health, fat loss, endurance, and more. For many of us, however, there's nothing more grueling than another grind on the treadmill. Fear not, elliptical evaders; rejoice, cardio connoisseurs! This collection of supplement, nutrition, and training techniques will heat up your cardio results every time you put foot to mill, stair, or road. 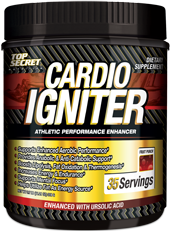 Boost your cardio power! With proper supplementation, you may be able to increase energy, endurance, and fat loss! Life never has to get in the way of your cardio training. These four tricks will help you fit in those necessary sweat sessions! As summer rolls around, move your cardio workouts outside, taking in the fresh air & providing some fresh terrain. Since most of you are not interested in becoming marathon runners, I'll show you how to structure your cardio program for fat loss. Use the following methods to optimize fat loss! Sure, you do cardio, right? Everybody who trains knows it's necessary to keep body fat levels low... Here are 5 types of cardio, a sample program to support your fat loss goals and more!